Welcome to Jacquie Harding who has just joined CLERA and Networks for Languages as the new CPD Teacher Educator for Modern Foreign Languages. Jacquie was born and bred in Birmingham so, as she says, “I’m a local lass.” She holds a B.A. Hons degree in French and Hispanic Studies from the University of Nottingham and a MSc in TESOL from Aston University. The moment she obtained her Honours degree, she moved to Madrid where she lived until very recently. During that time she gained experience in English language teaching where she taught all the CEFR levels and ages. In 2005 she started to work as a Teacher Trainer for Cambridge University Press, Iberia where she learnt about the latest methodologies and publications. 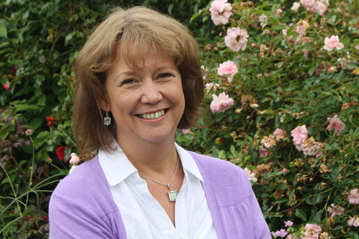 She has delivered teacher training workshops and presentations in schools, at Cambridge events and at ELT conferences. She’s also been involved in the setting up, development and execution of a Teacher Training Services project called The Cambridge Toolbox – www.thecambridgetoolbox.org. Jacquie is particularly interested in course book and classroom materials; the speaking skill; development of vocabulary; motivation; new technologies and CLIL. Her principle objective as CPD Teacher Trainer at Aston is to organise and deliver a programme of Continuing Professional Development to teachers of languages in the primary, secondary and further/higher education sectors. CLERA already has two CPD events planned for 2013. 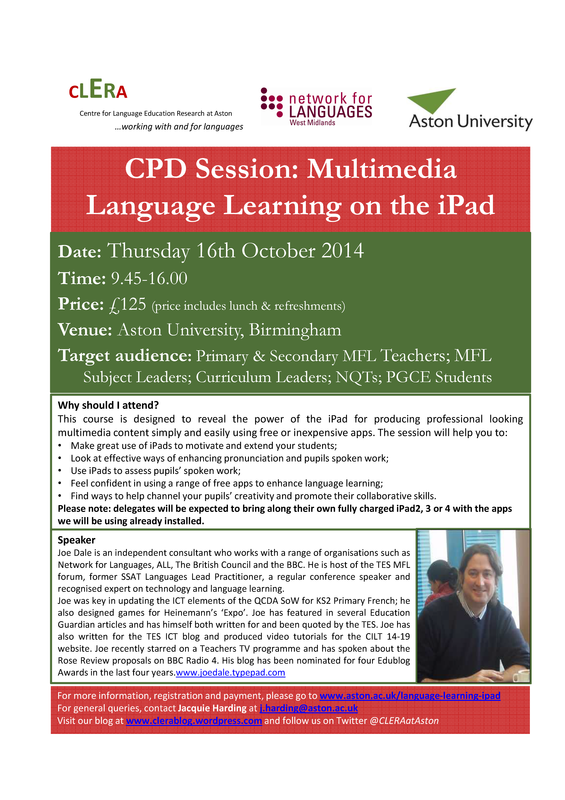 The first is a practical workshop on 9th January on the use of digital video in the Modern Languages classroom and a workshop on 11th June outlining the benefits of Content and Language Integrated Learning (CLIL) in MFL degrees in UK Higher Education. For more information, please click here. Jacquie welcomes suggestions and requests for further CPD events in the field of language education. 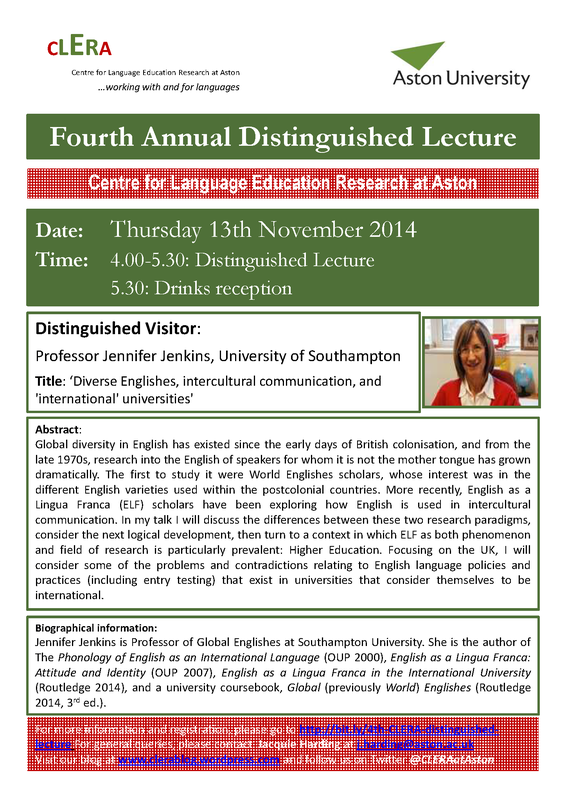 Please feel free to contact her at j.harding@aston.ac.uk with any ideas you wish to discuss. In the talk series ‘Meet the Professor’ sessions at Aston University, some of our acclaimed academics talk about their career path, how and why they got to where they are now. 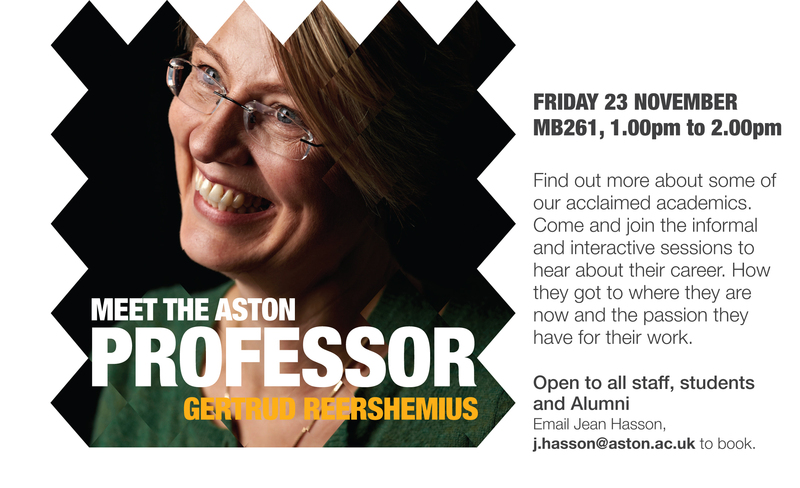 The series continues this coming Friday with Gertrud Reershemius, Professor of Linguistics and Co-Director of CLERA. 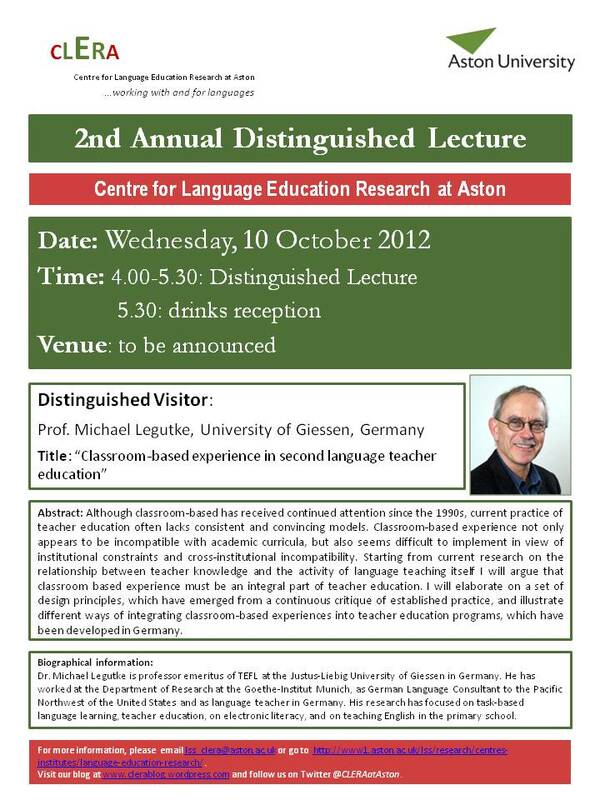 On Wednesday, October 10, 2012, Prof Michael Legutke from the University of Gießen, Germany, will give CLERA’s 2nd Annual Distinguished Lecture, titled “Classroom-based experience in second language teacher education”. Prof Legutke will be the second Distinguished Visitor hosted by the Centre, following last year’s successful visit by Prof Donald Freeman who gave the Inaugural Lecture at the official Centre launch (click here to learn more about the event). Dr Fiona Copland, Senior Lecturer in the Aston English group and member of CLERA, has been awarded a prestigious National Teaching Fellowship. As one of only 55 recipients of this year’s Fellowships, the HEA recognized her outstanding work and contributions to higher education. Fiona is Course Director for distance learning MSc programmes in the field of Teaching English to Speakers of Other Languages (TESOL). She also contributes to Aston’s Postgraduate Certificate in Professional Practice, providing professional accreditation for practitioners in Higher Education. Fiona has presented at numerous international conferences and published widely on her research interests which include feedback in teacher training and education, international students’ experiences in the UK, linguistic ethnography and research interviews. As one of the key researchers within CLERA, Fiona, along with Prof Anne Burns, Dr Sue Garton and Dr Muna Morris-Adams, is currently investigating Key Factors and Challenges in Transition from Primary to Secondary Schooling in ELT: An International Perspective, in a project funded by a ELTRP British Council grant. To learn more about Fiona’s work, go here and here. On July 5-6, 2012, the 6th biennial LLAS conference entitled ‘Language Futures: Languages in Higher Education’ took place in Edinburgh. The rich conference programme included plenaries from distinguished scholars and policy makers such as Prof Jim Coleman (Open University, chair of University Council of Modern Languages UCML; click here to download his presentation slides), Prof Rosamond Mitchell (University of Southampton), Prof Colin Riordan (University of Essex) and Prof James Foreman-Peck (Cardiff University), alongside two days of paper sessions from UK and European researchers and practitioners working in Higher Education. The key note speeches gave an excellent overview of the status quo – and the future – of MFL teaching and learning in the UK and the plenary discussions contributed to a wider understanding of the challenges which universities are facing in relation to national educational trends. The themes of the conference focussed on employability, the value of the year abroad experience, internationalisation and MFL for non-specialists, among others. A wide range of papers and presentations offered insight into current practice and innovative solutions at a wide range of HE institutions in the UK and elsewhere. For a full list of the papers presented, go to the conference website to download the programme. Two members of CLERA presented papers at the conference: Dr Claudia Gremler presented findings from a project on video production in the language classroom (read a good practice report on her project on the HEA website), and Elisabeth Wielander talked about content teaching in the target language, presenting some of the findings of her on-going PhD project investigating CLIL in UK Higher Education. A number of delegates from UK universities expressed their interest in CLIL and their institutions’ intention to expand target-language delivery in undergraduate MFL programmes, which opens possible avenues for future cooperation and dissemination of these findings. Both papers sparked lively Q&A sessions which provided valuable feedback and led to stimulating discussions with other researchers, and both conference papers will be revised and submitted for publication in the future. The key goal of CLERA is to promote collaboration among researchers in the areas of first and second language learning and teaching, language teacher education, language contact and language education and intercultural communication at Aston’s School of Languages and Social Sciences, and to establish international research networks and partnerships. If you would like to receive information about CLERA’s activities, please subscribe to our mailing list here or sent an email to info_clera@aston.ac.uk.